Elevation data are essential to a broad range of applications, including forest resources management, wildlife and habitat management, national security, recreation, and many others. For the Commonwealth of Pennsylvania, elevation data are critical for natural resources conservation (including the effects of drilling for oil and natural gas), agriculture and precision farming, flood risk management, infrastructure and construction management, water supply and quality, geologic resource assessment and hazard mitigation, and other business uses. Today, high-density light detection and ranging (lidar) data are the primary sources for deriving elevation models and other datasets. Federal, State, and local agencies work in partnership to replace data that are older and of lower quality. A joint goal of Commonwealth and Federal partners is to provide a temporal and density refresh of the current statewide coverage in order to support existing and emerging applications enabled by improved lidar data. 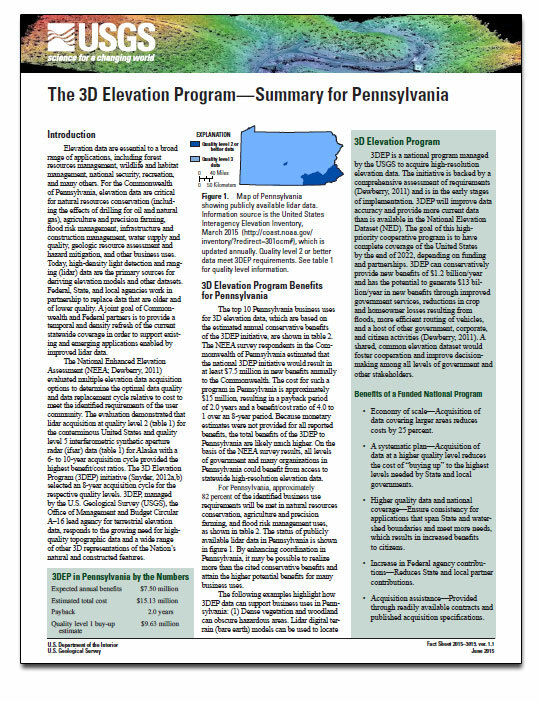 Carswell, W.J., Jr., 2015, The 3D Elevation Program—Summary for Pennsylvania (ver. 1.1, June 24, 2015): U.S. Geological Survey Fact Sheet 2015–3019, 2 p., https://dx.doi.org/10.3133/fs20153019.